The Architect should be the very first professional you need to talk to from the moment you start nursing the idea of embarking on a building project of any sort. Even if you are not yet financially set to start the project, it’s very important for you to consult an Architect and share your building ambition with him/her. This may require you to take the Architect to the location of your landed property, let him observe the area himself and take cognizance of the surrounding existing buildings (if any) in the area. Open up to the Architect on the options of building types you are considering, and the Architect will advise you on what will best suit your landed property in relation to your needs and financial power. When approaching an Architect, it’s always very important to be very open to him/her about how much you think you are willing to invest in that project, as it will guide the Architect in rendering his professional advice. Getting a professional advice from an experienced Architect will help position you properly in making your financial plans and projections in preparation towards the project. Plan and prepare financially towards the project. A lot of people make the mistake of starting a building project without coming up with a proper financial plan on how to complete the project. This takes us back to the importance of getting professional advice from an Architect. When you get professional advice, it gives you a rough idea of how much it will cost you to start and finish the intended project, because the Architect has access to a good Quantity Surveyor and other needed professionals in the building industry. When you have an idea of the rough cost, you need to take a look at your finances and your income. Whether you are a regular salary earner or a business person, you should have a knowledge of how much you earn on the average every month and annually. Then, you should decide how much you can set aside monthly or annually to help you raise the needed funds to get done with the project. When you have saved up at least 20% of the projected amount, you can consider starting the project and then take it gradually, depending on how long you take to finish the project. Depending on the kind of building project in question, you may also consider getting loans from the bank, especially for buildings that are meant for commercial activities like hotels, blocks of shops, office spaces and the likes. No matter the method with which you intend to raise the funds for the project, you should come up with a proper financing plan for the project based on your savings and income, then you can proceed to the next stage. Before you finally commission the Architect to start work on the Architectural designs for the building, it’s very important to think through everything thoroughly. Ask yourself all possible questions putting all factors into consideration. You must be able to convince yourself that you are really ready to start. Be very sure that the kind of building you have concluded on building is exactly what you need and will meet your exact needs. This is very important because a building project is about one of the most expensive projects you will embark on in your life time. So, you don’t want to make a wrong investment. You also have to put the future into consideration, especially when you want to build a private home building, you have to consider the fact that sooner or later, your children will move out of the house, and at that point most spaces in the house could just be a waste. You have to make sure you are taking decisions that you will not regret later. 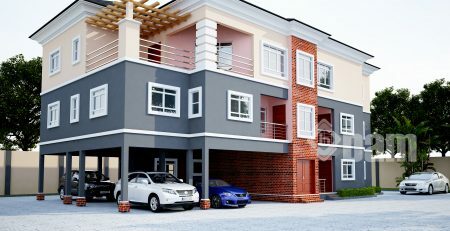 If you are considering building a house that will require you living with tenants, you have to be sure that you really don’t mind living with tenants in your building. Take all possible present and future factors into consideration over again before you proceed, so that at the end of the day you will enjoy the lasting satisfaction that comes with completing a befitting building and avoid any regrets in future. It can be very disheartening to come back every day to a building that gives you so many reasons to be sad and to think there’s nothing you can do about it can even be more heart breaking. So please, think through very thoroughly. Based on all your prior discussions with the Architect, you can ask him to go ahead with the initial presentation sketches. Don’t be in a hurry to OK the presentation sketches from your Architect, rather take ample time to study the drawings very well and ask him to explain everything in details to you. Be sure you are conversant with the sizes of the spaces in the design. If possible ask the Architect to use a measuring tape to show you the sizes of rooms and spaces in the house, just to be sure you are very OK with the sizes to avoid any shocking discovery during or after construction. You have the right to criticize the sketches from the Architect. Feel very free to ask your Architect questions especially regarding the natural ventilation and lighting of the interiors. If possible get pictures of previous buildings you have seen and liked and show and make your Architect understand the things you are looking out for. Ensure that you are 100% OK with the design before you give the Architect the go ahead to get done with the final detailed working drawings. Make sure you are working with a very sound and competent Architect. Avoid consulting quarks who will demand cheaper fees from you and do a poor-quality job for you. Hirer a good Architect and pay him/her well to do an excellent job for you to avoid the back and forth of building and tearing down during construction. Get the building plans completely registered in the appropriate Government offices. Often times, your Architect should be able to help you get the building plans properly approved in the required offices, depending on your region and location. You can also take the drawings to the registration offices yourself and get them approved, but it’s always advised to leave that to your Architect as he/she will be well experienced in handling the registration of the plans based on his relationship with the officers in the appropriate offices, to avoid unnecessary delays and extra expenses due to your lack of proper information and knowledge as regarding registration of building plans. Before you start construction, ensure that all registration requirements have been properly met to avoid interruption of construction from govt. officers. Also make sure that all requirements from the community where your land is located has been duly met before you start the construction work. All of these will help ensure smooth execution of the project. It is still very good to allow the Architect to recommend a reliable and experienced contractor to execute your project. If you are working with a firm that renders a design-and-build service, that makes it even more perfect and easier for you. Before you consider awarding the contract to any one, it’s advisable for you to see their previous projects and be sure they are well experienced and competent enough to execute the project excellently and successfully. Get them to submit their quotes for the construction of the project and let them break it down into milestones and also give you a work time schedule for every stage of the project. To help you plan yourself better. It’s also best to do a personal research and be sure that the figures your contractor has quoted are not exorbitant and way above usual so you don’t get unnecessarily cheated. It’s also important to decide on the quality of materials you expect your contractor to use just to be sure you are not short changed on the project. Always get your Architect involved. Many people often make the mistake of not involving the Architect’s supervision during construction. Even though you have so much confidence on your contractor, it is always advisable to place a contract with your Architect to be making regular visits to the site and ensure that the contractor is adhering strictly to design. During construction, there could be need to make some amends on the design of the building and you will really need the services of the Architect should there be such need for amends. It is also very important to involve your Architect during construction because it is the Architect who designed the building and he/she will always protect your interest in ensuring that his design comes out perfectly well. He will ensure that the right building materials will be used as specified in the drawings, and make sure the building comes out exactly as designed. Ensure to visit the site regularly. No matter the level of confidence you have in your Architect and contractor, it’s always very good to visit the site regularly and make keen observations at every stage of the work. This is also very important because as the project proceeds, you get to see a better interpretation of what was designed and should there be any parts of the building that does not go down too well with you, you can quickly request for amends there and then. It could be a lot more expensive to request for changes in a building after the project has long gone beyond the stage where you desire an amend. So always ensure to embark on frequent site visits and always be observant on the work. If the project is done in a location far away from you, demand frequent if possible daily picture updates from your contractor, by that way you can still be carried along on the ongoing work even in your absence. Never make the mistake of going for cheaper quality materials because of lack of funds. If at any point in the project, you experience shortage of funds, it’s best to put the project on hold until you have been able to raise enough funds to get the best for your building. You don’t want to compromise good quality and start spending money later to manage poor quality materials used in executing the project. No matter what, always go for top quality materials that will stand the test of time. In summary, I really need you to understand that every building project is delicate and must be treated with high level of caution and carefulness. Do everything possible to avoid taking steps that will land you in regrets in future. Always insist on working with professionals at every stage of the building process.